Our fresh, contemporary, surf-themed hotel is now the best buy in Waikiki! You'll be welcomed by our all-new surf decor from the moment you enter the lobby. Just steps away from the world's most famous beach, and some of the best shopping and night life in the world! Our totally renovated rooms command breathtaking views of the Koolau mountain range. The quiet side of Waikiki just got a little wilder! The Hawaiian Monarch Hotel is conveniently located overlooking the Ala Wai Canal in Waikiki with the Hawaii Convention Center and Ala Moana Shopping Center a short stroll away. Tropically decorated rooms have scenic ocean, mountain and city views. 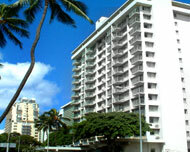 This moderate hotel is centrally located to all the attractions of Waikiki, world-class shopping and dining. The hotel guest rooms feature air conditioning, color cable television, mini-refrigerator and voice mail. For relaxation, the hotel features a swimming pool, spacious sun deck and for your convenience a sundry shop and activity desk. If you're looking for a great deal, come and visit Hawaiian Monarch Hotel with their clean and comfortable rooms are among best of Hawaii condos, vacation rentals and condominiums. Situated on northwest Maui's renowned Kaanapali Beach, this elegant full-service resort hotel offers a famously massive, 85,000-square-foot water park. Kaanapali's shopping and dining mall, Whalers Village, is next door, and two public, tournament-grade golf courses lie across the street. Westin's signature all-white Heavenly Bed, seven layers of bedding including a fluffy down-filled duvet, highlights each extra-spacious guestroom. A balcony and a marble bathroom are among other room comforts and conveniences. The out-of-the-ordinary water park offers five swimming pools on three levels, a long water slide, a grotto spa, koi ponds, and a rocky mountainscape of lush gardens, rushing streams, waterfalls, and winding paths.